Hamilton Barrett remembers the "Talking Cat of Ingleside"
Over the course of the "I am OMI" project, hundreds of neighborhood memories will be gathered and preserved. Taped oral histories are being transcribed and will appear on this Web site as they are ready! We need your help to identify interview candidates and conduct the interviews! Already many volunteers have stepped forward, but we need more! Join people like Maria Picar, Ray Wilson, Reverend Roland Gordon and others who are sharing and collecting memories to save OMI history! "From Randolph to St. Charles there was a long straight asphault pathway that was the best place to ride your shoe skate coaster. You know, a 2x4 with half a skate nailed on either end and 2 crosspieces, 1 to sit on and another for your feet. You "steered" by leaning right or left. The game was to see how far up the slope toward St. Charles you could go after avoiding a crash on the long downgrade from Randolph. 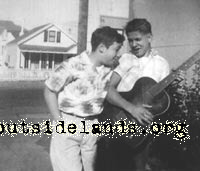 Image: Ray Wilson and friend singing Elvis songs in the 1950s on Granada Avenue. Photo courtesy Ray Wilson.